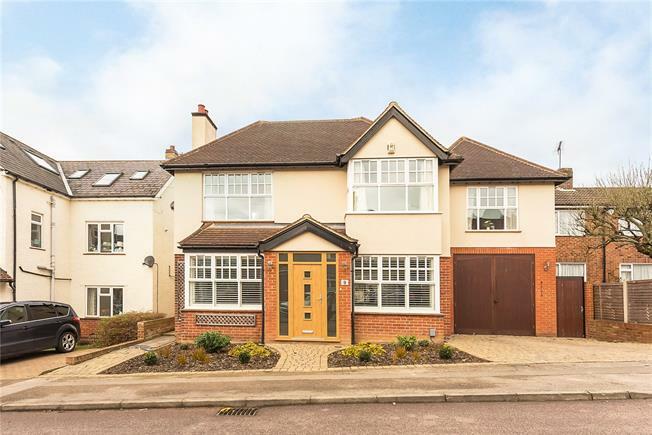 5 Bedroom Detached House For Sale in Harpenden for Guide Price £1,195,000. Features worthy of particular note include the stunning modern kitchen, with a large island and high specification appliances including, induction hob, wine cooler and ovens. The kitchen leads onto a large family/dining area at the back of the house with bi-fold doors onto the garden and there are two further reception rooms on the ground floor along with a spacious hall, utility and cloakroom. On the first floor there are 5 double bedrooms and three bathrooms. Grove Avenue is a quiet residential road, close to the much favoured Grove School and only around 1.5 miles from the High Street and Station, with an excellent range of local amenities closer still. The garden is a delightful and generous feature of this fine house having been professionally landscpaed. An expanse of bi-fold doors at the rear of the house lead to an extensive paved terrace with raised water feature, beyond which lies an area of lawn, bordered by well stocked shrub beds. To the front is a pretty front garden with a driveway leading to the oversized garage.